There is a psychic dreaming game played at every IASD conference where everyone tries to dream a target image in advance. Images are selected from a random pool and then someone, a sender, is given 4 envelopes, each with a different image. She pulls one of these as the target and begins sending the imagery out to all the participating dreamers, many of whom have been trying to dream the image several days in advance. I wasn’t able to attend the latest IASD conference in Anaheim this year but as luck would have it, I’m in an online group of psi dreamers who participate in cyberspace. We all tried to dream the target image from our homes in the week before the conference. I was discouraged by my own dreaming. 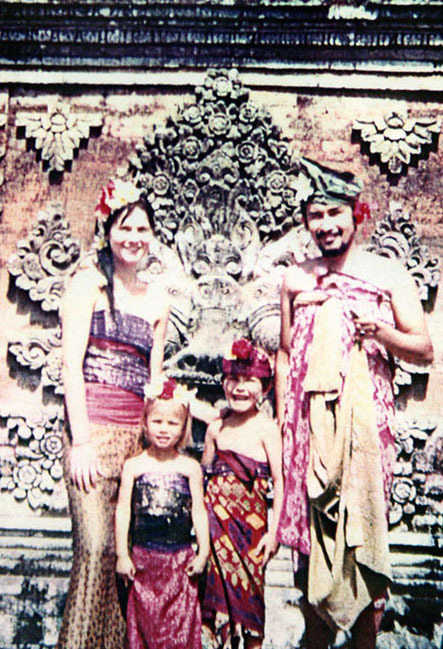 I was about to begin a whirlwind trip through Indonesia and Malaysia with Michel and my family. We had a few destinations well planned out, an artist residency in Malaysia followed by the Toraja International Festival in Sulawesi. But due to our flights and other scheduling details we had a week in the front of these events when we could go to any number of places. We considered a lot of exciting options, Tokyo, Singapore, Yogyakarta but finally our sentimental favourite rose to the forefront and insisted on our attention. Once we’d decided to go to Ubud, Bali, somehow all the pieces of this complex travel puzzle fell quickly into place, like a rubik’s cube waiting to be solved. Ubud has drawn me in since my first trip there at age three. I was at the perfect age to be marked for life by the twirling, golden, colourful dancers who all looked like princesses to me. I’ve been back many times since so there was a nice comfortable feeling in beginning this adventure in a place I know. In the week leading up the psi game I was dreaming of dancers in Bali, hearing gamelan music as I fell asleep, seeing all the swirling and the twirling colours in my mind’s eye. It was as if I’d already dashed ahead, impatient to get to our destination. I didn’t bother noting these dreams, as I chocked them up to mental overflow from all my travel planning. When the four possible target images were selected, the first one I saw was of two Balinese dancers. That made me laugh, like the cosmos was winking at me to say, when you think you know what you are dreaming, you really don’t know anything. The other three images were strong and clear as well, three frogs, a pyramid and a camel, and a tuba player. I joined in with the other online psidreaming participants and considered our dreams collectively and our best guess for a hit. We’ve been working with notions of ripples of precognition, how we should be noting syncs or hits with target images not just before a psychic game but also after. Because why should hits after a game be discounted based on some kind of linear time bias? Studying this wave on both sides of a target has now become part of our practice. We also note things that pop out at us in our waking lives as often we notice synchronicities there. I confessed my strong attachment to the image of the Balinese dancers. But then, my upcoming trip could be influencing me. A Google image search turned up a website with the target photo that confirmed that yes, these were Balinese dancers (Wiki now tells me they are from the Sekar Jepun dance troupe in Yogyakarta), and that they are depicted dancing a less known dance called the Oleg or Bumblebee dance. Oh, I had assumed they were dancing something I’d seen often like the Legong. Apparently a distinguishing feature of the Oleg dance was the raised arms of the female dancer as she lifted the sashes of her sarong like wings. The dance speaks of how the male and female in nature are dependent on one another, a lovely egalitarian sentiment. And then the target image was revealed! It was almost anti-climatic for me that it was the photo of the Balinese dancers. I felt they’d been calling to me from afar for decades, a kind of pull that is described well in Elizabeth Gilbert’s Eat, Pray, Love. If you have an island filled with people offering gifts to spirits several times a day, often in a quest to increase tourism and bring awareness of their island to others, isn’t the place likely have a stronger pull than others? It’s something I regard with a hint of suspicion, wondering, what does this place want from me or have I got it backwards and I return regularly because of what I want? Triumphant in any case, my action plan to honour the dreaming game and all the dreams I’d had was to get my psidreaming friends a fresh new photo of some dancers very soon. I like to bring dream energy into waking life this way and the process is important to me. I thought the target photo might be vintage since the version I saw of it had a kind of sepia cast to it, and this rare dance was unlikely to be on my radar during my short 5 day stay in Ubud but I would bring them a photo with similar energy. As it turned out, after two days in Ubud, I hadn’t gone to see any dances at all. I did pick up a program of dances in the area but none of them mentioned anything like the Oleg or the Bumblebee dance. Never mind, I decided, I should be relaxing, getting over my jetlag. What will be will be. In the past, we always went to Ubud Palace to see the traditional dances, the same palace we’d stayed at when I was a small child, back when there were no hotels. And we did end up near there one night but instead of heading to the Palace we were at a restaurant across the street, listening to a friend play a blues gig. After he’d finished I dashed across the street, impatient to catch the tail end of a dance that might still be ongoing, questing for that elusive photo of dancers I’d promised to my dreaming pals. In my haste I left my family behind. After seeing that all the dances were long since finished, the Palace empty, I turned to discover my dad, Walter, had tripped on the uneven sidewalk in the dark and had nearly fallen flat on his face. Luckily Michel had grabbed onto his arm in the nick of time. Was my photo quest was making me neglectful? It was not the first time during our trip that we’d been up and down the busy street in front of the Palace. The day before we’d stopped to buy a durian at the market nearby. While my dad was negotiating with the durian seller in Indonesian, asking me what I thought of the price and the particular fruit she was offering, we were interrupted by a tourist curious about durians. In the midst of all this back and forth, four people talking at once in many languages, my youngest son tapped on my arm, said something quickly to me and waved his hand. I nodded and went back to the durian negotiations. When we’d concluded the sale and had our prized fruit firmly in hand we turned and looked through the throngs of tourists milling around. There was no sign at all of Michel and the kids. We walked towards the shop we thought they had gone to, but no sign of them there either. We went around and around along the crowded, noisy strip of road, blocked by cars and motorcycles, tired sweaty tourists and irritable vendors, searching endlessly. We stopped and had an ice cream across from the durian seller and waited to see if they would emerge. But after an hour or so we gave up and made our way back to the hotel, the pungent durian dangling from my arm. As it turned out, the boys had gone in the entirely opposite direction and had also sat in front of a durian seller waiting for us, except it was the wrong seller a block away. And they went back to the hotel by a different route. This tedious mix up, this expanse of lost time, reminded me of something from last summer. I remembered all of us being stuck in Nice, France, wandering along the Promenade des anglais, desperately trying to find a bus back to our vacation rental, wasting hours waiting for buses that never came, being rejected by taxi drivers, until finally we got Uber working and one of their drivers rescued us. I was so annoyed by it all that I adamantly refused to go back into the city the following day. That fateful day turned out to be the day a truck drove into the tourists on the Promenade des Anglais and crushed so many of them to death. I flipped my perspective on the bubble of time that had trapped us and also kept us from being there at the site of the tragedy when it happened. I was no longer annoyed but was instead grateful. What ripple or wave was reaching out before and after that tragic, violent event? So I took this repeat of a kind of trickster energy as a sign that we should probably stay away from Ubud Palace, which now felt to me like the place of lost family and tripping grandfathers. It was a harsh decision for my photo quest but I tossed that aside. And there was a community centre near our hotel that also offered dances. Why not go there instead? It was just a short walk and would greatly decrease the margin of error and the number of hazards along the way. So at the last minute we arrived at the le Balai Banjar Ubud Kelod and hastily bought our tickets. We were greeted by several women in pink sarongs, members of the all female gamelan orchestra. That was a pleasant surprise, as gamelan orchestras are nearly always male. We were seated by a breezy open window and given jasmine flowers for our hair to indicate that our ticket was paid. I took one photo after another now, thinking how nicely these photos would fulfil my action plan. And as luck would have it, the dancers were often wearing sashes and were holding them up a lot. Gradually, after a few more dances and more photos, I saw the target image appear before me and begin to move. The female dancer raised her sashes and the male dancer moved delightedly around her. Amazing! I snapped one photo after another but it was dark and as they moved quickly the photos were fuzzy so I switched to video instead. I left the dance hall very satisfied, excited to be able to send off a nice souvenir photo as promised to the psi dreamers, my action plan fulfilled, and all so comfortably. In the morning I asked Michel for the program we’d been handed in the dark as we’d entered so I could note the name of the dance troupe. I also pulled up the target image so I could try to grab a shot that was a bit similar. I noticed immediately that the sarong of the male dancer was very like the sarong of the male dancer in the target image. And was that the same fan, the same head dress? The costumes were the same. This really was turning out to be rather astounding. I studied the program and discovered, aha, that the performance I’d videotaped was the Oleg or Bumblebee dance! I’d found it entirely by accident! I uploaded the video to my dreaming friends and they were suitably impressed. In the program, I read the history of the female gamelan orchestra who had overcome all kinds of social pressure and were finally allowed to perform in public about 13 years ago. Their quest for equality was fitting with the theme of the dance as well. Maybe it’s not a ripple or a wave to find a lovely performance of the Bumblebee dance a week after the target image was revealed. Perhaps it’s simply that I was looking for a needle in a haystack and succeeded. But with the swirl of chaos keeping me from the Palace (where no one was performing the Oleg) and my utter lack of information before heading into the performance, I can only attribute it again to the power of many, many women praying on the island of Bali. Or was it the magical power of Angel Morgan, the dreamer whose story of sending the image to the dreamers at the conference in Anaheim matched my trip to come so wonderfully? Did the spirits around the dance know about the psi game in California and jump in to join us all? Or did the dreamers get pulled into the swirl of the dance and become one kind of tornado force of energy? Or am I making something out of nothing and isn’t this just a charming coincidence? And what if it had occurred the other way around, with me seeing a dance first and target image second, would that change how I feel? Because the way I feel is that I have been shown time and energy as a kind of universal spiral, a linking over continents, and a wonderful dance of a bumblebee that can soar over obstacles and be seen from afar by anyone with the clarity of vision to notice. And of course everyone should go to Bali to sense these energies themselves. And what better place for a dreaming conference in the future? May many more women play gamelan and may many more women enjoy hearing them. I sent one of the photos of the women playing gamelan to some female friends of mine in Montreal with the caption, there’s still time for us, let’s start an orchestra too! 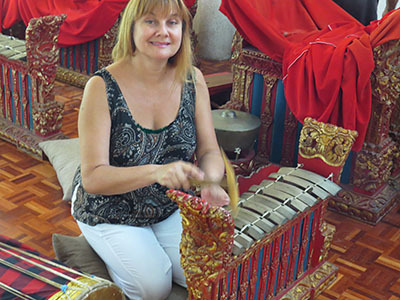 As it turned out, a week later I arrived at the Rimbun Dahan artist residency outside of Kuala Lumpur and one of the things I did there was play my own version of free jazz improvised gamelan in their wonderful dance studio. May my Javanese ancestors, female and male, be proud! One action plan has led swiftly and creatively to another and a new musical creation has just begun.